NHN is our community-based safety net for children, families and seniors in the greater Huntington area (including Richmond, Bolton, and Starksboro). 100% of your tax deductible donation helps people who are struggling with immediate financial crisis such as the inability to pay for fuel, electricity, food or other essential basic needs. Because the Community Church of Huntington (CCH) underwrites the administrative and operating costs for NHN, 100% of your donation goes directly toward providing confidential, short-term assistance. Online giving will be available soon. 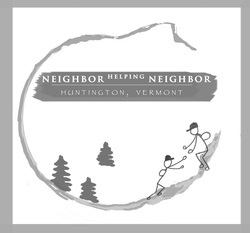 In the meantime, checks can be mailed to NHN, % CCH, PO Box 24, Huntington, VT 05462. For more information, please contact the church. Give to Neighbor Helping Neighbor here!